The early development of graph theory was heavily motivated and influenced by topological and geometric themes, such as the Konigsberg Bridge Problem, Euler's Polyhedral Formula, or Kuratowski's characterization of planar graphs. In 1936, when Denes Konig published his classical ""Theory of Finite and Infinite Graphs"", the first book ever written on the subject, he stressed this connection by adding the subtitle Combinatorial Topology of Systems of Segments. He wanted to emphasize that the subject of his investigations was very concrete: planar figures consisting of points connected by straight-line segments. However, in the second half of the twentieth century, graph theoretical research took an interesting turn. 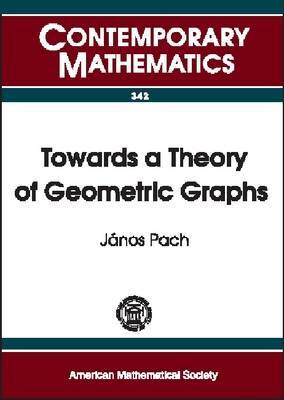 In the most popular and most rapidly growing areas (the theory of random graphs, Ramsey theory, extremal graph theory, algebraic graph theory, etc. ), graphs were considered as abstract binary relations rather than geometric objects.Many of the powerful techniques developed in these fields have been successfully applied in other areas of mathematics. However, the same methods were often incapable of providing satisfactory answers to questions arising in geometric applications. In the spirit of Konig, geometric graph theory focuses on combinatorial and geometric properties of graphs drawn in the plane by straight-line edges (or more generally, by edges represented by simple Jordan arcs). It is an emerging discipline that abounds in open problems, but it has already yielded some striking results which have proved instrumental in the solution of several basic problems in combinatorial and computational geometry. The present volume is a careful selection of 25 invited and thoroughly refereed papers, reporting about important recent discoveries on the way Towards a Theory of Geometric Graphs.